Sushi Island is a unique and original Marinepolis-designed concept device that allows Sushi Land to take its restaurant experience on the road! The transportable sushi conveyor belt was the brain child of sushi-loving engineers in Japan in the 1990s who wanted to be able to bring the kaiten-zushiya, or conveyor belt sushi restaurant, to private homes and parties. 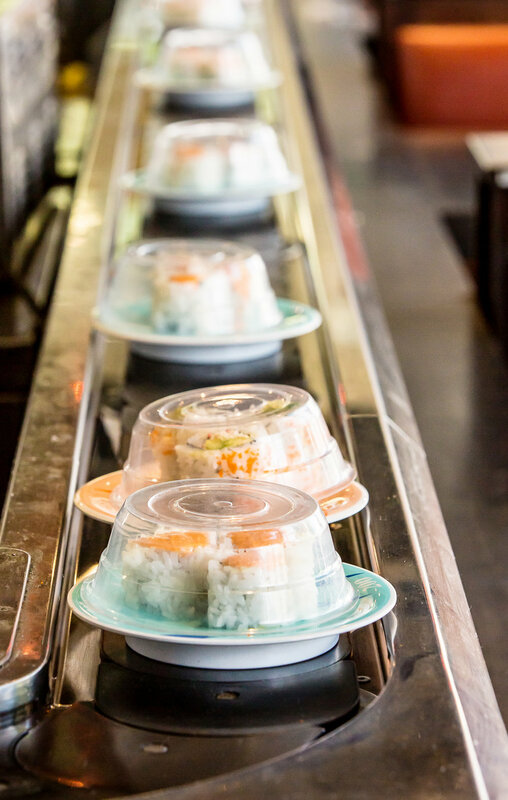 The invention was an instant success and another portable sushi conveyor belt was constructed for exclusive use by Marinepolis USA in 2001 and Sushi Island was born! The fact that this is the only device of its kind – in Japan and the United States – makes it a fantastically innovative and memorable catering opportunity. Sushi Island is made up of various components and pieces that are assembled on-site in about an hour by trained Sushi Land chefs. As similar to our restaurants, chefs work behind the belt making the same items available at Sushi Land storefronts. Party guests enjoy helping themselves to various items circling on the conveyor, just as they would at our store! The device's design allows different sizes to be assembled given the amount of pre-ordered sushi and the space allotted for the event. We bring everything to you. Our portable conveyor belt, ingredients for sushi, sushi chef(s) and all necessary supplies and equipment. Location RequirementsPreferably indoor and on the first floor with a convenient water supply. A higher floor is okay if there is an elevator available for use. We'll need at least two weeks of advanced notice to prepare the Sushi Island service. Call 503.297.1575 or send an e-mail to assist@sushilandusa.com to schedule an event or to request additional information.